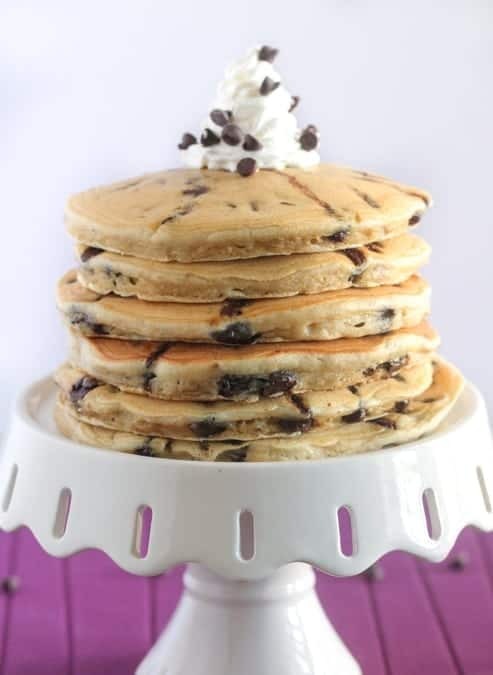 These Chocolate Chip Malted Pancakes are the perfect addition to any breakfast and brunch menu. 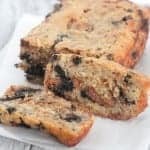 Soft, malted and stuffed with loads of chocolate chips! I looooove making a fun breakfast for my family. Especially on the weekends. Nothing like seeing the smiles on my boys face when I serve a big stack of pancakes. I jazzed up my favorite Buttermilk Pancake recipe (from my cookbook) today with some malt powder and chocolate chips. Not even kidding, these babies don’t even need syrup. A nice dollop of whipped cream and you are good to go. 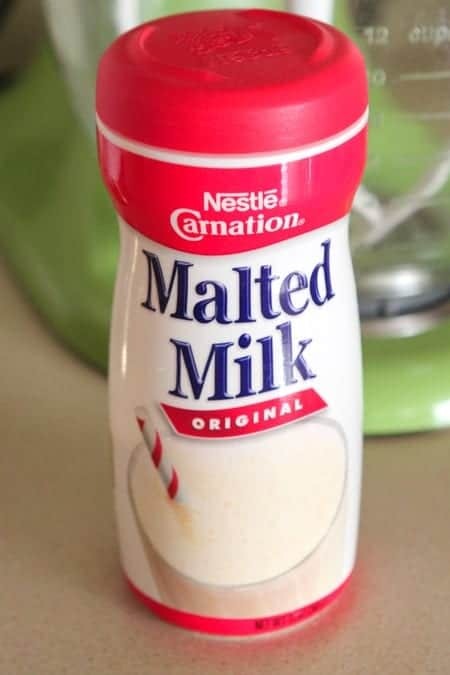 Malted milk….this stuff is magical. 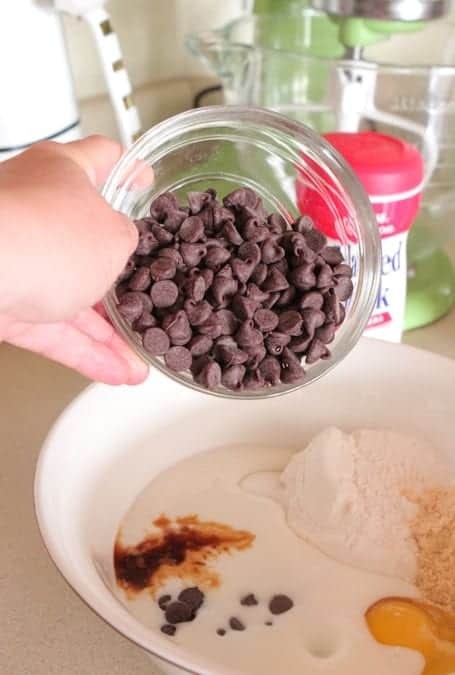 I’ve used it in pancakes, cookies, muffins, you name it….it’s amazing! You’ll find it near the chocolate milk in your grocery store. Mix up your pancake batter. Nice and simple. Stir in some chocolate chips and they are ready to be cooked up! Stack those babies nice and tall….and enjoy! 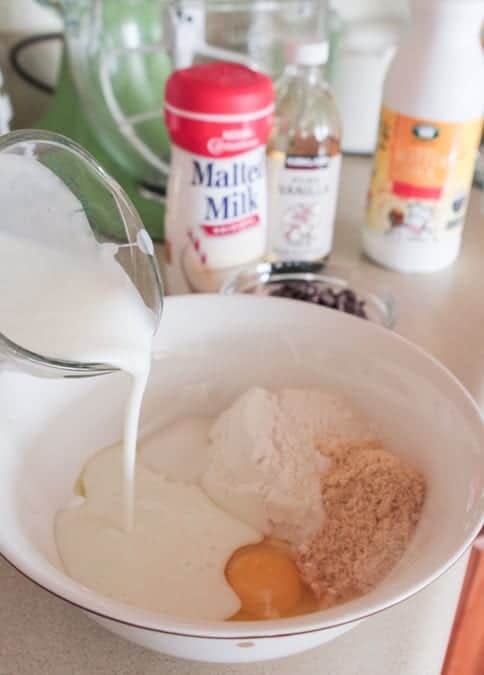 Place flour, malt powder, sugar, baking soda, salt, buttermilk, egg, vanilla and chocolate chips into a large mixing bowl. Stir until well combined. Heat a large skillet over medium heat. When hot, spoon about 1/4 cup batter into center of pan. With spoon, form round pancake quickly. Let cook for 60 seconds or until batter starts to bubble. With spatula, flip and cook an additional minute or until cooked through and browned. Continue until all batter is used. To prepare whipped cream whisk heavy whipping cream and sugar in mixing bowl until whipped cream forms. 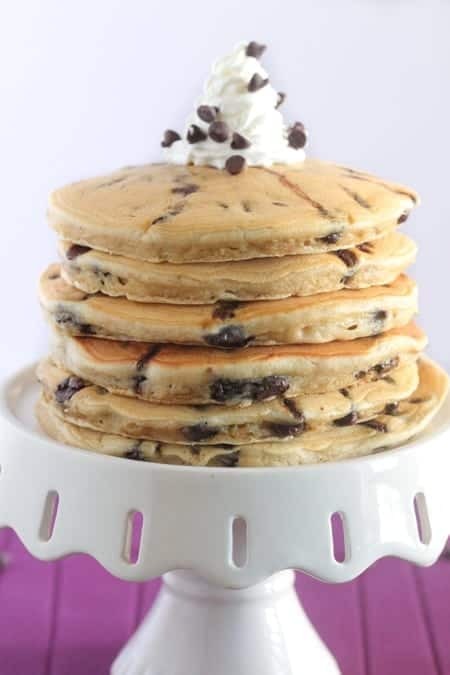 Top each pancake with a dollop of whipped cream and additional chocolate chips if desired. I love pancakes especially when they look so perfect! I am so wanting a stack of these right now! I never thought about adding malt to pancakes, they must be amazing! Well, these are simply genius!! I’ll stack the entire stack, please? Pancakes are definitely my weakness. I’ll take twenty! I will never ever turn down a stack of these beauties!! I love anything malted!!! One of my biggest cravings in life is a chocolate malt- what a smart idea to add it to pancakes!! I need these pancakes for breakfast, lunch & dinner! It’s never occurred to me to add malted milk to baked goods. This is genius! I’m not sure I’ll be able to wait until next weekend. These may be a weeknight Brinner meal. These look AMAZING! I love pancakes!!!! I haven’t had chocolate chip pancakes in years though. Yummy! I used malt powder in a cake recipe once and LOVED it!! I can’t wait to try it in pancakes!! Love the malt addition! I have yet to bake with it – it needs to happen! 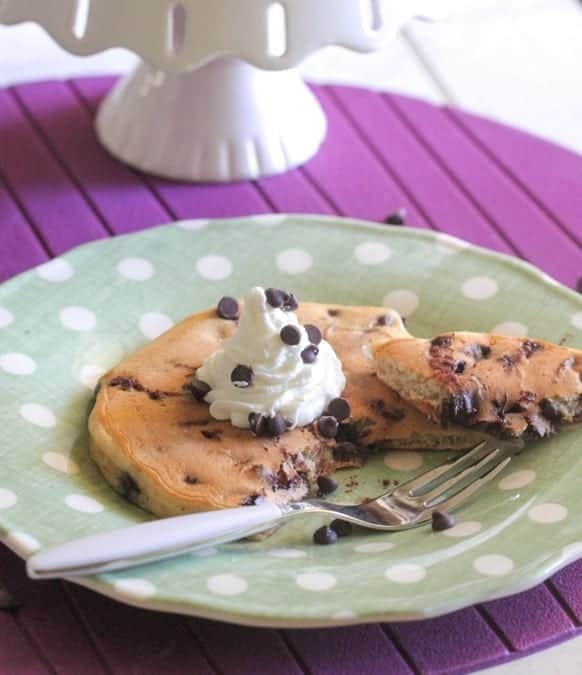 These pancakes are happening soon, great idea! Ooooh! Malted milk! these look so good Jenny!! Now that’s a stack of pancakes – your lucky boys! 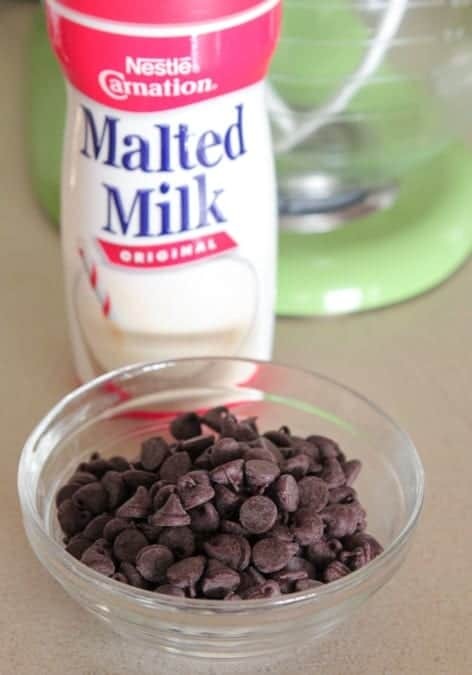 I’ve never seen malted milk like that in the supermarket – great idea! 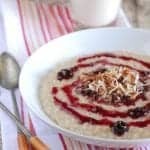 oh my gosh, I totally want these for breakfast tomorrow morning!! We are totally going to have to give these a try! Yummmmm. What an absolutely fun way to jazz up pancakes!!! My kids would love these for sure!!! Love malt flavoring and love chocolate in my pancakes! Looks like a match made in heaven!! I’ve been needing a recipe to use up the malt powder in my pantry. Yum!! I have been looking for malted milk everywhere and I can’t find it. I’ll have to check near the chocolate milk next time! Thanks for the tip! My family loves this recipe and today I decided to put a twist on it. What I did differently today was to add chopped malted milk balls. (I hit them with the rolling pin) I left out the chocolate chips. I also increased the malted milk to 1/4 c. I think the little carton of malted milk balls were 3.75 oz. My family loved these also. Thanks for a great recipe!